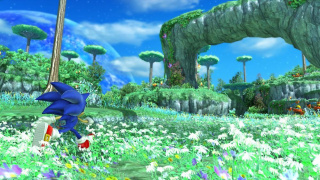 Planet Wisp is the ninth level in Sonic Generations, and an adaptation of the level Planet Wisp seen in Sonic Colors. Eggman's unfinished planet from his Amazing Interstellar Amusement Park appears once again, bringing its thrilling heights and platforming with it. Unlike it's previous incarnation, this version of the stage has more of the actual planet along with the familiar metal structures. It also has a lot more... dangerous things around, like various buzzsaws he is using in construction of this massive planet. 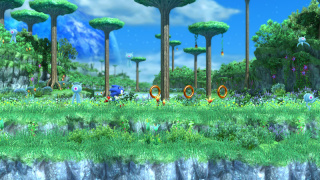 This level retains some of the Wisp powers seen in the Wii version of the game, and each Sonic gets one Color Power, which they must use to get through their act. Modern Sonic gets the Orange Rocket power to achieve new heights in the structure, with the addition of Rocket-only breakable walls. His act also adds various mine carts traveling around carrying supplies and workers for the structure, which he can control upon landing on them. Classic Sonic gets the Pink Spikes power to climb up various walls and ceilings. He must use this power to stick to various wheels and spin them to unlock various changes in the structure to help him proceed. After freeing this world, the Chaos Emerald that was frozen in this section became obtainable. Classic Sonic went to go grab it but was cut short by Modern Sonic boosting right to it. This surprised Classic, who thought that was awesome. Along with this, Charmy Bee is freed from the white void. Sandworm - These Badniks come out of blue hatches on the ground, walls and ceilings and shoot balls of energy at you. Egg Pawn - These are Eggman's construction crew here. They may swing their pickaxes on you at point blank or throw them forwards like a boomerang.